Trees or shrubs, with a resinous, gummy, caustic, or even milky juice. Leaves alternate, simple or ternate, or unequally pinnate, without pellucid dots. Fls. terminal or axillary, with bracts, commonly dioecious, small. Sepals 3 to 5, united at base, persistent. Petals of the same number, (sometimes 0), imbricated. Stamens as many as petals, alternate with them, distinct or coherent, and perigynous. Ovary 1-celled, free. Ovule one. Styles 3 or 0. Stigmas 3. Fruit a berry or drupe, usually the latter, and 1-seeded. Albumen 0. Genera 48, species 100, chiefly natives of tropical regions, represented in the U. 8. by the genus Rhus only. Properties. - These plants abound in a resinous juice. which is poisonous, but is used as an indelible ink in marking linen, and as an ingredient in varnish. Even the exhalations from some of the species are deemed poisonous. The Cashew nut is the product of a small tree of both Indies. When fresh the kernel is full of a milky juice, and has a most delicious taste, but the coats are filled with a caustic oil which blisters the skin and kills warts. RHUS, L. Sumac. (The ancient name, from Celtic, rhudd, red?) Calyx of 5 sepals united at base; petals and stamens 5; styles 3, stigmas capitate; fruit a small, 1-seeded, subglobous, dry drupe. - Small trees or shrubs. Lvs. alternate, mostly compound. Fis. often, by abortion, imperfect. 631. Rhus, leaf and panicle. 2. A stam-hiate Dower. 3. Section of a fertile flower. 1 R. glabra L. Lvs. and tranches glabrous; lfts. 11 to 31, lanceolate, acuminate, acutely serrate, whitish beneath; fr. red with crimson hairs. - Thickets and waste ground, U. S. and Can. Shrub, 6 to 15f high, consisting of many straggling branches, smooth, except its fruit. Lfts. sessile, except sometimes the terminal odd one. Fls. in terminal, thyreoid, dense panicles, greenish-red, . Fertile ovaries, clothed with grayish down, which in fruit becomes crimson, and contains malic acid (bi-malate of lime, Prof. Rogers), extemely sour to the taste, Jn., Jl. The bark of this and other species may be used in tanning. The drupes dye red. 2 R. typhina L. Branches and petioles densely villous; lfts. 11 to 31, oblong-lanceolate, acuminate, acutely serrate, pubescent beneath: fr. red, with crimson hairs. - A larger shrub than the former, attaining the height of 20f, in rocky or low barren places, Can. and U. S. St. with straggling, thick branches. Lvs. at length 2 to 3f long; lfts. sessile, except the terminal, odd one. Fls. in terminal, thyrsoid, dense panicles, yellowish-green, often or . Drupes compressed, compact, the crimson down very acid. Jn. The wood is aromatic, of a sulphur-yellow, and used in dyeing. β. laciniata. Lfts. very irregularly coherent and incised; panicles partly transformed into gashed leaves. Hanover, N. H. (Rickard). 3 R. pumila Mx. Procumbent, villous-pubescent; lfts. 9 to 13, oval or oblong, coarsely toothed; drupes red, silky-pubescent. - In upper Carolina. Shrub, creeping extensively, with branches 1 to 2f high, bearing a subsessile, terminal, thyrsoid panicle. Lfts. all sessile, clothed with a velvety pubescence beneath, the three upper often confluent. This species is very poisonous. 4 R. copallina L. Mountain Sumac. Branches and petioles pubescent; lfts 2. to 21, oval-lanceolate, mostly entire, unequal at base, common petiole winged; fls. in dense panicles; drupes red, hairy. A smaller shrub, not half the hight of Numb. 2, in dry, rockyplaces, U. S. and Can. Compound petiole about 6' long, expanding into a leafy margin, between each pair of leaflets. Lfts. 1 to 3' long, near 1/2 as wide, dark-green, and shining on the upper surface. Panicles of fls. terminal, sessile, thyrsoid, , greenish. Drupes acid. Jl. 5 R. venenata DC. 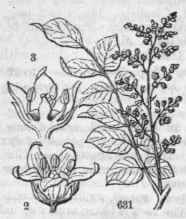 Poison Sumac. Dog Wood. Very glabrous; lfts. 7 to 13, oval, abruptly acuminate, very entire; panicles loose, axillary, pedunculate; drupes greenish-yellow, smooth. A shrub or small tree of fine appearance, 10 to 15f high, in swamp3, U. S. and Can. Trunk several inches diam., with spreading branches above. Petioles wingless, red, 6 to 10' long. Lfts. about 3 long, 1/2 as wide, sessile, except the odd one. Panicles axillary, , those of the barren ones more diffuse. Fls. very small, green. Drupes as large as peas. Jn. The whole plant is very poisonous to the taste or touch, and even taints the air to some distance around with its pernicious effluvium. 6 R. toxicodendron L. Poison Oak. Poison Ivy. Erect, or decumbent; lvs. pubescent; lfts. 3, broadly oval, acuminate, angular or sinuate-dentate; fls. in racemous, axillary, subsessile panicles; drupes smooth, roundish. - Can. to the uplands of Ga. A small, weak shrub, 1 to 3f high, young branches, and lvs. beneath downy. Lfts. 2 to 6' long, 2/3 as wide, petiolate, the common petiole 4 to 5' long. Fls. small, . Drupes pale-brown. Poisonous, but less so than the last. 8 R aromatica Ait. Sweet Sumac Lfts. sessile, incisely crenate, pubescent beneath, lateral ones ovate, terminal one rhomboid; fls. in close amenta, preceding the leaves; drupe globous, villous. - A small, aromatic shrub, 2 to 6f high, in hedges and thickets, Can. and U. S. Lfts. 1 to 2' long, 1/2 as wide, sessile, the common petiole an inch or two in length. Fls. yellowish with a 5-lobed, glandular disk. Drupes red, acid. May. Not poisonous. 9 R. Cotinus L. Venetian Sumac. Lvs. obovate, entire; fls. mostly abortive, pedicels finally elongated and clothed with hairs. - A small shrub 8f high, native in Ark. according to Nuttall (? ), remarkable chiefly for the very singular and ornamental appearance of its long, diffuse, feathery fruit-stalks, showing in the distance as if the plant were enveloped in a cloud of smoke. Fls. small, in terminal, compound panicles. Lvs. smooth, entire, much rounded at the end. In Italy the plant is used for tanning. 10 R. cotinoides Buckley. A large tree, 40 to 50f in height, in woods on the high mts. of N. Car. (Buckley). Also in Ark. (Nuttall?). We have seen no specimens, and are unable to give the specific differences between this new species and R. Cotinus, if, indeed, it be distinct, as is probable.